London & Singapore, Oct. 28, 2013 — A new survey of the CNBC Global CFO Council released today, shows that chief financial officers from major international corporations think that global economic growth is improving and are looking to expand their companies’ workforce. 22 percent said economic growth would be ‘stable’ and nine percent see it ‘modestly declining’ over the next six months. The survey also shows that employment figures could be about to get a boost, with 56 percent of the CFOs surveyed saying they plan on expanding hiring over the next six months. Four percent said they are planning to lay off staff and 40 percent predicting no change. When asked to rank the health of various business conditions based on the current economic climate, CFOs said stock market valuations and credit availability were modestly high. More than 80 percent of respondents also expressed concerns of slowing growth in emerging markets, with just nine percent indicating that they were unconcerned. When asked about which macroeconomic issues the CFOs were most worried about cyber attacks ranked as a major concern, followed by China’s slowing growth, the Federal Reserve's tapering of stimulus, currency volatility and terrorism. The CNBC Global CFO Council was recently expanded to include members from Europe and Asia Pacific. The CFOs represent companies with a total market capitalization of $800 billion for Europe and Asia Pacific. The elite group, which represents public and private companies from a wide array of different industries, are able to present a global and regional picture of the state of the economy and market sentiment. Council members share their frontline insights and unique views on the key issues and challenges facing today’s corporations and the broader business community. Following the successful launch of Council in the Unites States, the new members will make on-air contributions throughout the year to CNBC’s flagship morning programme Squawk Box on its regional TV networks in EMEA and Asia-Pacific and online at cfocouncil.cnbc.com. 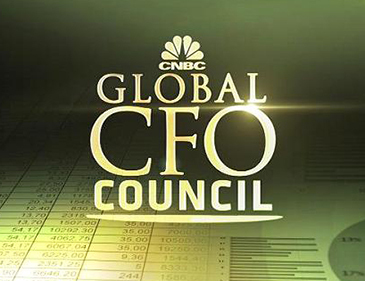 A full list of the CNBC Global CFO Council members can be found here. The survey of CNBC Global CFO Council was conducted between 21st-23rd October 2013 amongst its 33 members in Europe and Asia Pacific, who collectively manage around $800 billion in market capitalisation.